Countdown to Hannah & George – 2 weeks! Hey, right, I have a blog..! Sorry folks, I know this here old Visitorium has been sitting idle now for longer than it ever has. And there’s all sorts of stuffs going on right now and I can barely spare the brainpower to keep track of it all. Here’s a tip…MAGNETIC NORTH. It should be enough to keep any theatre fan going for a few days or so. I was even lucky enough to catch the premiere of THE PUBLIC SERVANT at the GCTC last night, making a triumphant return after debuting at Undercurrents about 3 years back. 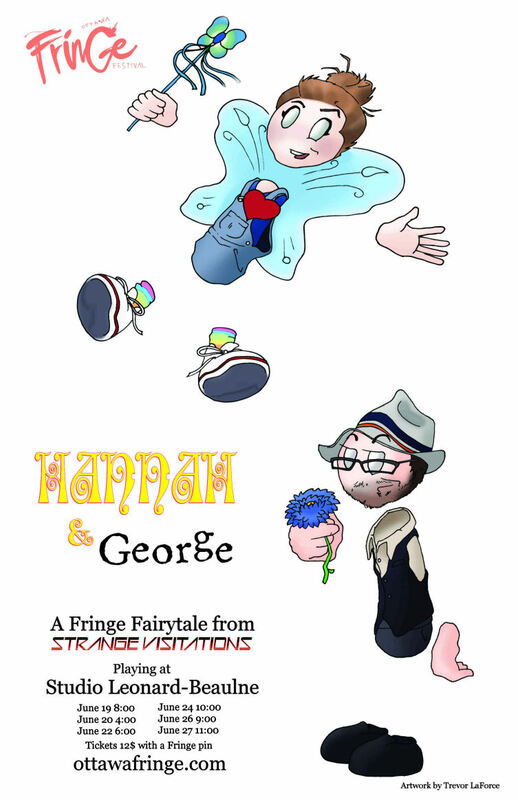 But for the most part, I’m too busy to take part in any active bloggery OR theatregoing, and it’s because me and thee rest of the Strange visitations gang are heading into the final two weeks of pre-production on our Fringe debut show, HANNAH & GEORGE. Our mostly silent, but somehow still noisy clown-inspired romp follows lonely George Q.Simpleman and his constant fairy companion, Hannah Glorianna (to harken back to her historical full name from way back when she first popped, ill-formed, into my noodle last year) and the troubles that ensue when love enters their cozy relationship. Poster artwork for Hannah & George by the incomparable TREVOR LAFORCE! We’re still hard at work putting the finishing touches on props, set and soundscape, in a show that has proven way more daunting than I ever dreamed it would be when I penned the first draft in January. Since then, the show has become a truly collaborative process, morphing in rehearsals again and again with input from myself, co-star Madeleine Hall, Director Jodi Morden, and stage manager/rehearsal cook Rebecca Laviolette. It’s become something very different than I started out imagining, and definitely something more as well. I can promise a few things about this show…we WILL earworm you, that’s a certainty. Madeleine Hall WILL steal your heart as Hannah, the ultimate manic pixie dreamgirl. I will embarass myself in hopefully the most story-driven and heartfelt ways, again and again. We will make you laugh, smile, and hopefully cry just a teeny bit. And there MIGHT be candy.